Growing up, stuffed peppers were a dinner time staple. The hearty and healthy peppers were filled to the brim with browned ground beef and overflowing with flavor. Now you can revisit this classic dish with a contemporary twist. The smoky flavors of chorizo and chipotle make these peppers an outstanding treat. Top with spicy Pepperjack cheese and enjoy the Mexican-inspired flavors in this classic dish! Bring a large pot of water to a boil. Place peppers in boiling water and cook 5 minutes. Remove and set aside to cool. 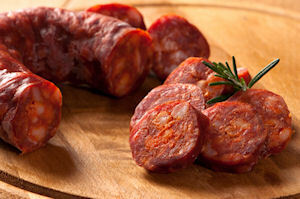 Preheat oven to 350 degrees F.
Add water and rice to chorizo. Bring to a simmer and cover. Cook 15 minutes or until rice is fully cooked. Remove from heat and mix in cheese, reserving a portion for topping. Place peppers upright on a baking sheet. Stuff each pepper with chorizo mixture and sprinkle with extra cheese. Bake in preheated oven about 30 minutes or until peppers are soft and cheese is melted and bubbly. Serve immediately. Very hearty. We loved it. I didn't have the chipotle hot sauce, so just substituted with chipotle powder spice. Summary: Growing up, stuffed peppers were a dinner time staple. 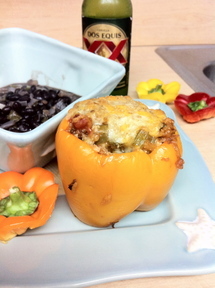 The hearty and healthy peppers were filled to the brim with browned ground beef and overflowing with flavor. Now you can revisit this classic dish with a contemporary twist. The smoky flavors of chorizo and chipotle make these peppers an outstanding treat. Top with spicy Pepperjack cheese and enjoy the Mexican-inspired flavors in this classic dish! Mexican flavors make these plain baked potatoes into a fiesta in your mouth.